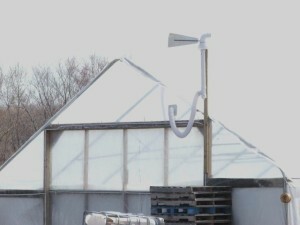 The Amish use a device to inflate the double walls of the plastic on their high tunnels that does not require electricity–it is wind driven. It has a cone or funnel to catch the wind, a pivot, and a vane to keep it directed into the wind (see photo below). The device in this photo does not have the funnel. The pivot looks like it was made from the plastic piece that attaches a flushing toilet to the floor. In wind storms that blew the plastic off several high tunnels in Missouri, all those with the wind inflation vanes did not succumb to the high wind problems. The Amish farmer said that the stronger the wind blows, the tighter and stronger the covering becomes.